I am sharing detailed summary/comments for chapters 1-3, followed by general comments. The main character is Skyco. He's part of a war raid and has just missed being shot by an arrow. He's pulled to the ground. At first he thinks it is the enemy, but it turns out to be Roncommock, the shaman who is accompanying him. Skyco and Roncommock are Algonquin and speak Algonquian. The enemy tribe speaks a different language. It sounds like snakes hissing, so, the Algonquins call them the rattlesnake people, the Mangoaks. "...good move for our next dance. Do you think you could teach the others? The snake jump?" No longer worried about the enemy, the two head on back to their village, Chowanook. Skyco hears a noise. It is a bear. It knocks Roncommock down, mauling his shoulder and thigh. Skyco has no weapon to use, so decides to roar at the bear. That roar stops the bear from attacking Roncommock. Skyco roars again and the bear goes away. Roncommock is bleeding heavily. Skyco takes off his loincloth and wraps it around Roncommock's thigh. He keeps an eye out for moss he can use to help with the bleeding. He also finds a brown puffball, which has dust that Skyco sprinkles on the wound. As they make their way, Roncommock leans heavily on Skyco. "That bear was powerful and we need the medicine man's magic to help restore your spirit while it fights that of the bear." "it is up to Roncommock to return to us from the world of the spirits." The next day, Roncommock is better and tells Skyco what he learned while he was in the spirit world, fighting the bear's spirit. He tells Skyco that the bear is the strongest of animals, but wise, too. He knows when to fight, and when not to fight. This bear is Skyco's "guardian spirit" (p. 22). The bear has been looking out for Skyco all along. Its spirit knew that someone was trying to hurt Skyco. When it saw Roncommock, it thought Roncommock was the person trying to hurt Skyco, so the spirit of the bear told the bear to attack Roncommock. Roncommock explains why the bear made that mistake. Because they were on a war raid, he hadn't been wearing his shaman clock and medicine pouch. Instead, he was wearing a bow and arrow and was wearing a warrior's loincloth. "the bear stripped me of my physical being and searched my spirit in the spirit world"
and realized that Roncommock was the Skyco's protector. It is very unusual that the bear recognized you so early, even before your spirit quest. The spirits are ready for you now and we will oblige them by beginning with learning the way of the spirits before you learn the ways of the warrior or the hunter. You must enter upon the sacred quest as soon as the spirits decree it, even before you enter the husquenaugh. Your training will differ from that of the other boys who will undergo the next husquenaugh as you pass from childhood to adult. You have more to learn." As I sat down, I carefully folded my legs so that each foot was underneath a thigh and rested my hands atop my knees, palms down, adopting the position I was taught. "You see before you my kin and recognized heir. I submit Skyco for the next husquenaugh. If he succeeds and becomes a man, he will be your next chief." Everyone inclines their heads in agreement. That night, Skyco thinks about the "grueling ritual" (p. 26) that will test his body and mind to see if he is strong and worthy enough to become an adult. If he fails, he cannot become an adult. "To fail is to die" (p. 26). (1) In her author's note, the author says that Skyco was a real person, kidnapped as a child, by Sir Ralph Lane, who led an expedition to Roanoke Island in 1585-1586. I found references to "Skiko" in several sources. This verifies that the author based this story on the life of a real person. Right away, I am concerned. The author, a non-Native woman writing in the 2010s, is imagining what a Native boy of the 1580s (and his family and members of his tribal community) would do, say, and think. As far as I know, we do not have records of these Native peoples' speech or thinking. The author has nothing to go on. There are some resources (like Lawson, who she cites in the back matter), but they're written by people who were not of that tribe. They were Europeans. They brought their non-Native lens to what they were writing. What we have, in essence, is a Native people of the 1500s, whose ways of that time were recorded by Europeans, and now, a non-Native writer of the 2010s, imagining their lives. In short, we have an outsider perspective on top of hundreds of years of time. (2) Several words in chapter one signal outsider voice and, by extension, a lack of understanding of words and what they convey. First is the use of "braves" for men. I noted it once but it occurs more than once. Dictionaries often define brave (as a noun) that is dated, and, is "an American Indian warrior." Synonyms are warrior, soldier, or fighter. My goal, in the writing I do about words used to describe Native people, is to push writers to stop using "brave" or "squaw" ("squaw" is not used in this book) because in addition to being dated, those two words (there are others, too) invoke an Indian man or woman--but with qualities that mark them as very distinct from a English man or woman, or a French man or woman. Amongst those qualities are ones that frame Native peoples as not-quite-human. More... primitive. More... barbaric. They, in short, otherize Native peoples, making them exotic and markedly different from non-Native men and women. I also highlighted shaman. That, too, is used by writers as if all Native peoples, everywhere, use that word. We don't. (3) In that passage where Roncommock tells Skyco that he can make a new dance step out of that frightened leap when he saw a snake is troubling, too. It demonstrates a lack of understanding of the significance of Native dance. Many of our dances are prayerful in nature, or, done in preparation for a gathering or event. It may be helpful for you to think of prayerful activities or moments within your own religious practice. Would something like leaping into the air be easily turned into part of what you do, in this religious activity? (4) When I read that detailed passage about how Skyco sat on the mat, I did it, just to see what that might look like. Sure enough, it is sitting "Indian style" without saying that. I'm glad Frick-Ruppert didn't say "Indian style" but why go into that detail? Why can't Skyco just sit down?! 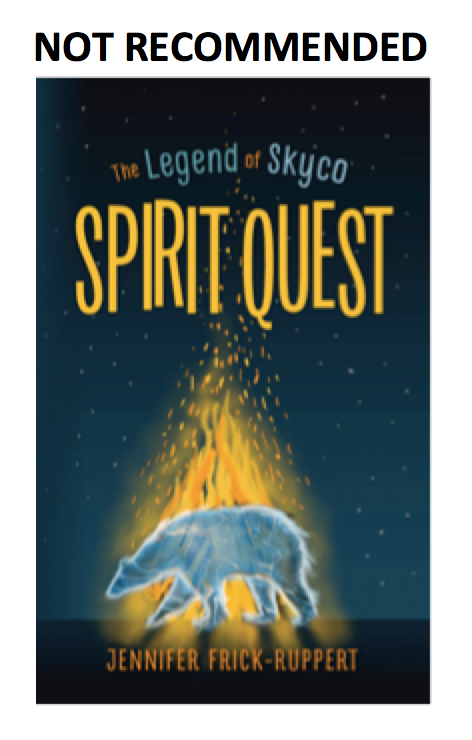 (5) Most of chapter one is about that bear, the spirit of that bear, how they determine that the bear is Skyco's "guardian spirit," and then Skyco's anxiety over the husquenaugh. I find all of that especially troubling, for the same reason I noted in (1), above. Frick-Ruppert's story is about real people and their ways of being. As I noted above, what are the sources anyone can use, to accurately depict the ways of this particular nation? In that back matter, Frick-Ruppert references "the Chowanoke Indian Nation" (p. 292) that is trying to get federal recognition. What, I wonder, would they think of what she's written? The spirits have decreed that you undergo the black drink ritual as a preparation for the spirit quest. Roncommock tells Ascopo to go, right away, to Memeo, who will do his training. Roncommock tells Skyco to take off his new loincloth because the black drink they take will get soiled during the ritual. Both drink it and almost immediately the contents of Skyco's stomach and bowels are purged. They do this a second time and then go to the river to clean up. When they get to Roncommock's wigwam, he shaves Skyco's head on one side and trims the length of it on the other side. Then they slather bear grease, tinted red, and then rest. Roncommock wakes Skyco. It is time to start. He is to inhale tobacco smoke that Roncommock sprinkles on a fire. If his mind is relaxed and open, the spirits will come. The spirits are powerful. They could strike a man dead, or ignore him completely. Skyco is a bit anxious but remembers the relaxation techniques his mother taught him. Soon, he feels as peaceful as a baby, and sees his mother. She touches him and points toward something out of view. That startles him. He wakes, and Roncommock tells him that his spirit is strong, that he hasn't been taught how to call the spirits, and yet, they came to him anyway. Skyco tells Roncommock he only felt his mother, touching him as if he was a baby in her arms, and that she had pointed. This, Roncommock says, means that the spirits have recognized him. They didn't reveal his quest, yet, but his mother, pointing, means they are ready to receive and teach him. They leave the wigwam to have the evening meal with the people of the village. Skyco notices things he didn't notice, before. Walking by his mother's wigwam he sees the paintbrush by their door. It is her spirit guide. Men have animal spirit guides, but sometimes, women receive a plant guide from the spirit world. She is the only woman in the village with a spirit guide. She can tell that he has been accepted by the spirits and brings him water with sassafras leaves. He takes some into his mouth to clean his mouth and the words he is going to say, spits it out and thanks his mother and family for all they've given him. He bows low before her, and then takes another sip of the water, spits it out, and turns to Roncommock and says he wishes to join his household. As with chapter one, there is a lot in chapter two that feels to me that it is created by the author. Creating the religious ceremonies of others makes me uneasy for so many reasons. It feels sacrilegious and presumptuous. This is the sort of content that New Age practitioners will use as authentic ways to get in contact with a spirit world. An aspect that bothers me is the gaze on the loincloth, on peoples faces, and their bodies. In chapter two, Skyco removes his loincloth so he doesn't soil it when the contents of his stomach and bowels are purged. ... crossed his legs, folded his feet under his thighs, and placed his hands on his knees in the appropriate position of respect. He tells Skyco to sit, too, but yells when Skyco nearly steps on an anthill. Skyco sits. He's given some herb water to cleanse his mouth and must wipe some over his eyes, nose, and ears so they, too are purified. Then he drinks some sacred water that will help him contact the spirits. Roncommock sprinkles some powdered uppowoc over the ant mound. The ants run about, picking it up. Roncommock tells Skyco to focus on them, and to try to reach one with his mind. He does, twice, and finds himself drawn to one, which is Roncommock. He scolds Skyco for thinking of the ants as male. All the ants are female. Skyco shifts his pronouns and thinks "she" rather than "he" as they move about. An enemy ant arrives and a battle between the two ant tribes ensues. In the clean up of the battle, Skyco learns many lessons about how the ant colony is similar to his own village structure. One of the cleaner ants approaches him and tries to identify him, based on his scent. Since he's new to the ant hill, he doesn't have a strong scent. He's afraid the cleaner ant is about to call others to come and drive him out, but realizes he can lift his abdomen and squeeze, emitting a stinky odor. The cleaner ant backs away. Eventually, Skyco and Roncommock return to their own bodies and then to the village. Here we have another instance in which someone's manner of sitting is carefully described. And again, this manner of sitting conveys respect. I would love to see a source for this! I understand the concept of training, of learning by watching others--be they insects or animals--but going into the ants, being an ant... that reminds me more of the Animorphs series than anything else. Perhaps the stinky odor is meant to bring a bit of humor to this story but given that Frick-Ruppert is asking us to think of this as part of a spiritual quest, I find it offensive. Please note that my offense is not that someone farts. I love Everyone Poops by Taro Gomi and have gifted it to children. My offense is that the author--in this imagined sacred space of a Native people--injects this particular kind of humor. I finished reading the book and have many passages in chapters marked. I am commenting on the more significant ones, here. The overarching aspect of this book is spirits, the spirit world, communicating with the spirit world, spirit quests, and having a spirit animal or a spirit guide. Indeed, we see that in the subtitle "Spirit Quest." Throughout the book, Skyco interacts with the spirit world. For each of the interactions, he will end up with an item to wear that will remind him that these creatures are his spirit guides. In chapter two, he was with ants. He can't really have something about ants on his body, so, he'll carry a bit of the sand from an ant pile in his medicine bag. Skyco is bit by a shark. He learns that a shark is one of his guides, so he wears a necklace of shark teeth to remind him of that. There's a part where Skyco and three other boys in training kills a deer. They eat its organs, thereby "taking on the power of the buck" (p. 215). You've seen that sort of idea, too, right? Indians eat this or that animal, gaining that animal's special qualities. In one of the chapters, Skyco tells Roncommock about visions he's had. Roncommock can't interpret any of this for him until after Skyco completes the husquenaugh, but as Skyco is telling him about what he saw, Roncommock gets up, walks around, and says to himself "could he be the one?" (p. 200). We aren't told what "the one" means, but, it sounds like the author is developing this story in a way that Skyco is going to be--as the title suggests--a legend. What Skyco saw in that part of the story is white people who will be coming to their lands. They won't understand boundaries, Roncommock tells Skyco. But, Skyco's training is important. He has spirit guides from the earth (the ant), the water (fish/shark) the sky (falcon) and land (bear). Towards the end of the story in the husquenaugh, we learn that Skyco will be a shaman and a chief. The others exclaim over that power and standing. The book ends with Skyco emerging from the husquenaugh. There, is, however, a second book in the works. As I noted in my comments to chapter one, I am concerned with the ways that Frick-Ruppert imagines the Native people in this story. She's relying on very old sources, written by Europeans, whose interpretations of what they saw then, in the 1500s, are--in fact--white Europeans who felt superior to the Indigenous peoples of what came to be known as the United States. There were differences, yes, but notions of superiority are highly subjective. Romanticizing anyone is no good, for anyone, least of all children. Most Native peoples do not write accounts that delve deeply into our respective spiritual or religious ceremonies. We guard all of that from people who want to appropriate it, or use it in ways that are harmful to us. Did Frick-Ruppert know that? Did her editor know? 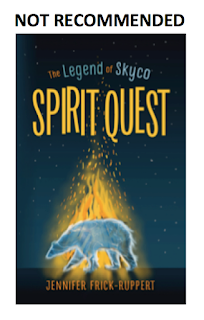 Bottom line: I do not recommend Jennifer Frick-Ruppert's The Legend of Skyco: Spirit Quest.